We left Ocean Springs this morning by 6:30, headed to Hattiesburg. Our objective was to pick up my mother and make it to Southbound Bagel and Coffee Shop in time for fresh-from-the-oven cinnamon rolls. 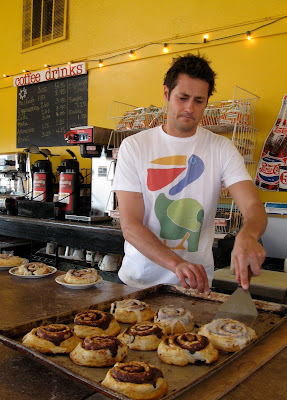 Southbound owner Chris Hackbarth serves up cinnamon rolls. 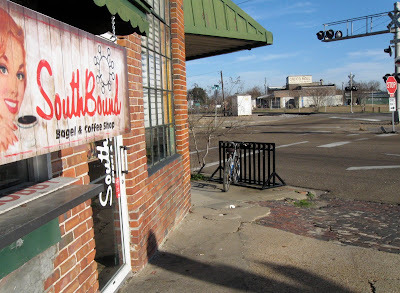 Located at the outer edge of the historic Hattiesburg downtown area, the coffee shop was busy with regulars tucking into omelets, banana bread French toast, and, of course, bagels made on site. Husband Walter had a bagel and coffee. Mother and I each had one of the huge cinnamon rolls – my sugar quota for February in one treat! 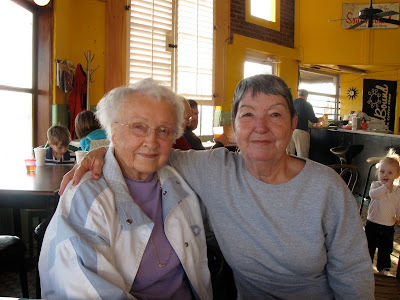 Another treat -- Mother, left, encounters friend Bernice Linton and her husband Henry who were enjoying breakfast at the coffee shop. Those cinnamon rolls in your picture look wonderful...I can almost taste one...all I got was a frozen bagel!